My favorite website of all time was from the ill-fated dot-com “fintech” card issuer, NextCard. In 1999, it was light years ahead of its time in design and UI. If only it had been equally savvy in its underwriting skills, it would be a digital banking giant by now. What I loved about its website was the almost total lack of copy. In an era where most traditional brands dumped everything they could think of on the homepage, NextCard made due with just 50 words of copy, an almost “Google-like” experience (and this was before Google). See its circa-2001 homepage above. The nice thing about the NextCard effort, besides the big red “easy” button dominating the page, is that the whole thing fit nicely on a single desktop computer screen. That was back when horizontal and vertical scrolling were the norm. Fast-forward 15 years and the vast majority of banking websites are MUCH, MUCH, MUCH better. And I am a big fan of responsive design. It’s forced designers to pare back on overly busy home pages that have been a hallmark of banking sites since the 1990s. However, I think we are now in danger of becoming over-reliant on responsive design, at least on the desktop. Yes, it’s cost-effective to build a single site that works across all screen sizes. But if you are big enough to have a six-figure marketing budget, you can afford to tweak your site so it sparkles on both smartphones and desktops. I don’t want to single out anyone, but I need an example, so I looked at a few sites in the Seattle area and chose Washington State Employess Credit Union to illustrate my point. Its site renders great on mobile phones or tablets with an intuitive swiping down (or is that up?) layout (see inset for iPhone 6 capture). However, the same photos, fonts and layout rendered on a 13-inch laptop browser screen aren’t as elegant. The biggest issue is navigation. WSECU goes with the smartphone convention of a small “hamburger” menu in the upper right (see screenshot below). Users accustomed to mobile navigation will likely find it, but others may be perplexed. With no visible desktop navigation, the eye is drawn to the “We’re all in” main headline along with the two running across the bottom (“Look what’s happening at your branch” and “Reflecting on 2015”). None of those are particularly enticing jumping-off points for the casual online visitor. Overall, the WSECU site is pleasing to the eye and has easy-to-find login and search. However, the desktop version isn’t as effective as it could be explaining the products, services and benefits of banking there. And 20 years into web design, we should be more responsive to visitor needs. Sometime serendipity leads you to great places. Looking for inspiration this morning, I did a random search on Google for “banks in West Virginia.” The top organic result was City National Bank, an 82-branch bank headquartered in Charleston, West Virginia. If they were a fintech company, we’d be talking about how close they are to becoming a unicorn (current market value is just under $750 million). Easy-to-find site search: Placed in the upper right with a purple magnifying glass to give it a little extra polish. Well designed promo area: The four rotating promos are beautiful, with great visuals and dramatic color. Account opening choices: It’s important to showcase the ability to open online since that’s still not widely understood. But extra points go to City National for also not forgetting that many (most?) still like the support of opening in branch. Overdraft avoidance: The bank not only uses the O-word (on the homepage no less), but also helps customers avoid overdrafts (see also #3 above) (see note 1). Suggestion box: After #9, I’m not surprised, but it’s also rare to see this level of encouragement to provide feedback to the bank. 1. If you go deeper into the overdraft-avoidance advice, it’s not as consumer friendly as I expected. The bank could do more to promote overdraft-protection options. How important are mobile users to your sales efforts? 76% of Facebook’s ad revenue is from mobile (and it was considered by many to be a mobile laggard a few years ago). Prospective customers are already visiting your website from their smartphones in massive numbers. Are you making a good first impression? Does the UI work across key devices? And more importantly, is there an easy-to-find path to mobile purchase? Over the years I’ve rarely been impressed with the confirmation pages displayed after a user takes an action, especially completing an online loan or product application. Today, I came across a good example of a post-sale confirmation screen from RedBubble (see screenshot below), an online purveyor of smartphone cases, laptop skins, and so on (see inset). 1. Thanks for the order! 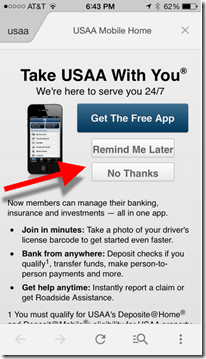 Last week, I caught up with the USAA folk to share thoughts on the future of mobile banking. They explained how they are converting visitors on the mobile web to their native app with a popup (interstitial) prompt (see inset). It’s the first time I’ve seen a bank use that desktop technique on the mobile web. It had been more than a year since I took a tour of major banks using my phone’s browser (Safari, iPhone 5, iOS7). The last time proved relatively uninspiring. Several banks showed a mobile-optimized view, but most defaulted to their desktop-PC view which is unusable without tedious “pinch and zooming.” And no one pushed users to the native app. Today, that’s changed dramatically. Of the 20 major mobile banking websites I visited, only one (Citibank) delivered a desktop-PC view (and that varied depending on which URL was used to enter the Citibank site). And four of the 20 pushed their mobile app heavily (and three more showed a download link to the app store). While there has been much talk about pushing customers to less-costly HTML5 and responsive-design mobile websites, it’s still an app world (1 million and counting on iOS alone). And that’s not changing if Apple has anything to say about it. If you have a native app, make sure your mobile customers know about it. Every mobile web front landing page should include a prominent link (above the fold) to your native app(s). And it’s not enough to simply show the Apple and Android app store logos. That’s too subtle for many novice smartphone users. Mobile Optimized View? Native App Call to Action? App Store link? Large Promo?